Every once in a while, I’ll run across a site running on the Genesis Framework. Actually, it’s more than every once in a while, but what do you expect when so many people use Genesis?! Anyway, sometimes I’ll visit a site running Genesis and notice that they’re running Genesis as the active theme, instead of using a child theme. I can’t help but shake my head when I see this, because not only is this incredibly risky, but we strongly recommend that you DO NOT run Genesis as the active theme on any site. When you read a tutorial for adding or removing things from your site output, it’s likely that the tutorial will say something like “put this code in your child theme’s functions.php file.” It’s hard to do that when you’re not running a child theme. Also, child themes allow you to run and manage your own CSS file. 100% custom, if you want. You can make your site look exactly how you want it to look, or use one of the dozens of child themes we sell here at StudioPress. The point is that you’re going to have a very difficult time customizing Genesis—and your site—if you don’t use a child theme. Once you’re done customizing your site, you want to protect all that hard work from being overwritten when we release an update to Genesis … and we’re always updating Genesis. Even when we’re not in an active development cycle, we’re still pushing updates to Genesis and preparing maintenance releases. And if we decide to change things in the default Genesis CSS, you want to be sure that your site design stays intact. A child theme keeps all your custom code and CSS safely in its own folder, so Genesis can be updated without affecting the look of your site. If you activate Genesis directly, we now show a warning on your dashboard that advises you to use a child theme. Do you really want to stare at that warning every time you log in to your site? Of course not! So, go get yourself a beautiful child theme and get rid of that warning for good! 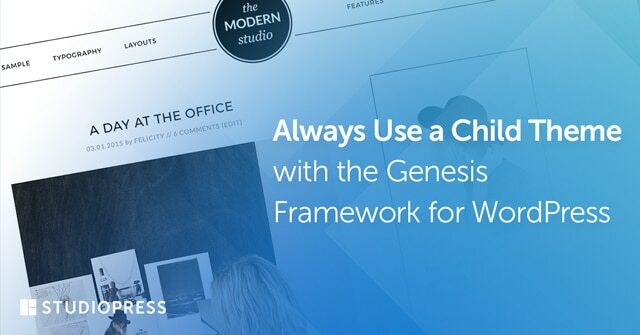 This boils down to separating the core functionality of the Genesis Framework from the specific customizations and design of your site. Let the framework be a framework. And let your creativity and custom code stay where it should stay … safely housed in a child theme. Genesis is not a CSS framework. And over time, the Genesis stylesheet has changed a lot. If you’re dynamically using the Genesis CSS as the base for your site’s CSS, sooner or later the design of your site is going to break. Always start with a fresh stylesheet in your child theme. Not only will this perform better, but it will keep all your CSS safe from any changes we make in Genesis. There’s really no reason not to use a child theme. I mean just look at all this beauty waiting for you over at StudioPress.